The ice is beginning to melt, and that means Ice Fishing season is over! Don’t worry, spring is just around the corner, and that anticipates spring fishing opener in Minnesota! Spring fishing in the Lake of the Woods is fantastic, and you’re going to want to pack up the family, and your RV. Did you know we have an area for your RV, you’ll enjoy our river bend RV resort right here at River Bend’s Resort and Walleye Inn! Here is what you can look forward too, with fishing this season, when you bring the family on a fantastic RV spring break trip. Waking up to the sounds of birds chirping, you’ll love being the comforts of your RV. Make a pot of coffee and relax, you’re on Spring Break, but don’t forget to cast your line! Fishing in the springtime is beautiful, with the forest coming to life in front of your eyes you’ll love early morning sunrises and later sunsets that make up a lovely trip to Minnesota with your family. While the weather is still chilly, you’ll want to have layers for when you’re on the water fishing, but the nighttime bonfire and cozy comforts of your RV at our RV Park will be worth the days casting away, adding to the quality time with those you love! As the flowers of Baudette MN, begin to bloom, and the buds on the trees sprout into colorful leaves, the fish will start their journey towards the Rainy River. Spawning grounds occur right on the river which means that spring offers an ideal opportunity to catch some fantastic sturgeon and walleye. Walleye fishing ends mid-April, so there is still time to get to our River Bend RV Resort, and you’ll find, that come May, fishing for walleye opens back up! 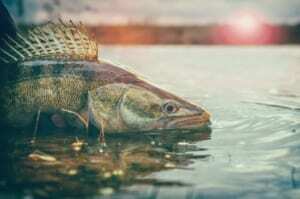 The Lake of the Woods will see more fish species with northern pike, sauger, muskellunge, whitefish, and more! Learn about our species you’ll find on the Rainy River and the Lake of the Woods, here, then make sure you’ve got the right tackle box and get to spring fishing! No matter if your searching for walleye or you’re here to spend some time on the water with your family, our River Bend’s Resort and Walleye Inn makes for the perfect spring getaway. Check out all of our other activities you’ll enjoy when you visit over the next couple of months!